What helped make this task easier? Would this task have been possible alone (putting a puzzle together blindfolded)? Is it easier as a group? Who made mistakes? Are mistakes okay? Did everyone finish at the same time? Is that okay? I had similar responses as mentioned in the original post: the blindfold and fitting the pieces were the most difficult; the need to have a shared understanding of terminology and the need to look at it from someone else’s perspective made the task easier; working together ensured the puzzle did get put together (as opposed to doing this alone); as for feelings, frustrated; mistakes were constantly made; and it was ‘okay’ that everyone did not finish at the same time. It was interesting walking around while the groups worked, progressing at different rates. Most groups worked the jigsaw like they would alone by isolating the edges and starting with the corners. A few groups struggled to the brink of quitting because the assembler wanted to do their own thing or because the director did not direct; it seemed to take the stronger personalities longer to find their groove of leading and following. Some worked up the middle, picking up on the patterns of color and shape that they could make out (I did a quick, ‘Yes!’ in my head). 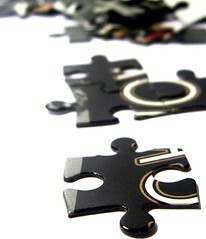 You see, I’d thrown away the boxes the puzzles came in and put the pieces in sandwich ziplocks. I wanted them to see/find the patterns. 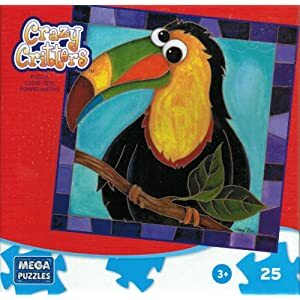 I realize these were only 25 piece puzzles, but often it’s the patterns students miss or overlook or don’t understand as they study Chemistry and Anatomy; so, this was an important point I wanted to make. And, every group did get the puzzle put together, so everyone was successful. The greatest teachable opportunity in this, though, was showing the group that was last, who didn’t ‘feel’ like they had been successful, that they really were. I purposefully expanded on this, using the last two discussion questions as a springboard. The point being if they felt overwhelmed by the content or the new technology they would be using in class (Twitter, blogs, wikis, web 2.0 tools, etc. ), perseverance and their reliance on each other would see them through the class. Those intangible, unmeasurable qualities behind learning. The only issue I had was the breakdown in focus in the class as they waited on a single group to finish; too many side conversations developed. I think next time, I’ll have these groups swap roles (and puzzles) to apply their lessons learned listed on the white board; let them see how well they learned from each others’ mistakes. It’s exciting to see where we’ll go from here and see how well each student will remember their lesson learned from today.